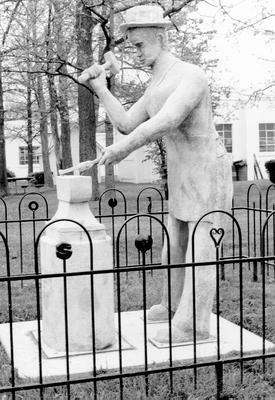 A blacksmith is depicted wearing an apron and a hat. He uses a hammer with his proper right hand to forge a horseshoe which he holds in his proper left hand. In front of him is an anvil. : “Chester - The Village Blacksmith,” Ohio Outdoor Sculpture Inventory, accessed April 20, 2019, http://oosi.sculpturecenter.org/items/show/592.